Rebecca Fagg received a Bachelor of Fine Arts degree in 1972 from the University of North Carolina at Greensboro. A number of instructors, who are also represented in the Weaver Collection, were a major influence on Ms. Fagg, including Ben Berns, Peter Agostini, and Andrew Martin. Other students from the same period who are also in the collection are Keith Buckner and Raymond Berry. 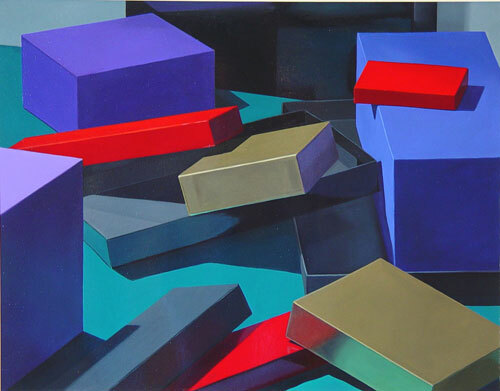 The painting, Twelve Boxes, is part of a “box painting” series. It shows Ms. Fagg’s remarkable clarity of the realistic rendering of her subject matter. Her use of light and shadow create dramatic imagery in all her work, including landscapes and interiors. In 2005, Fagg was part of an exhibition entitled, Hand to Hand, A Legacy of North Carolina Painters, which paid tribute to two renowned artists/mentors, Andrew Martin and Peter Agostini. The exhibition included work from these two influential art teachers, as well as the work of some of their former students, now accomplished artists themselves. Ms. Fagg’s work has been exhibited widely throughout North Carolina and beyond. She was the recipient of a Pollack Krasner Foundation grant. She is now part of their collection, as well as the North Carolina Museum of Art and the Weatherspoon Art Museum.